Whilst staying here for a few days we visited Rushden Station this afternoon and although the station finally closed 1969 it is now the home to The Rushden Transport Museum run by the thriving Rushden Historic Transport Society. 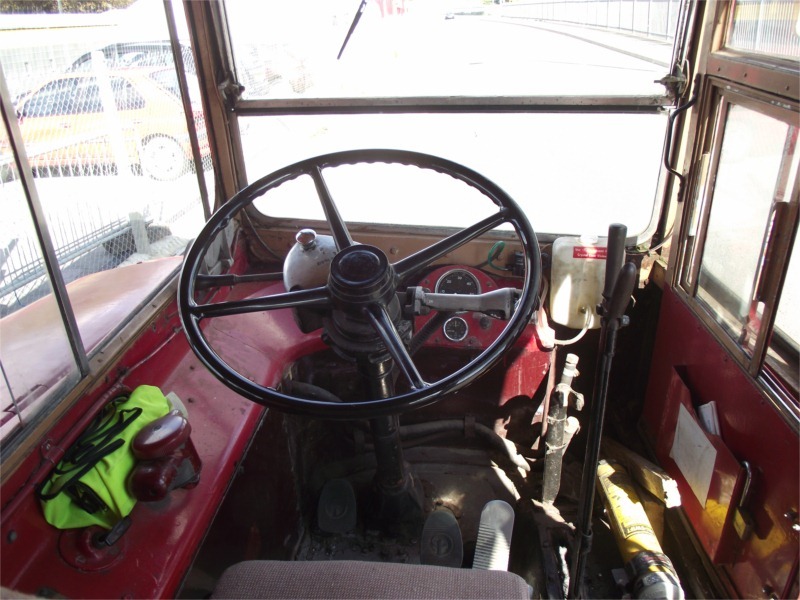 The museum was particularly enjoyable with an informal feel and it seems an access all areas policy, they have a working signal box and we were invited into a Travelling Post Office van which now houses a model railway layout. 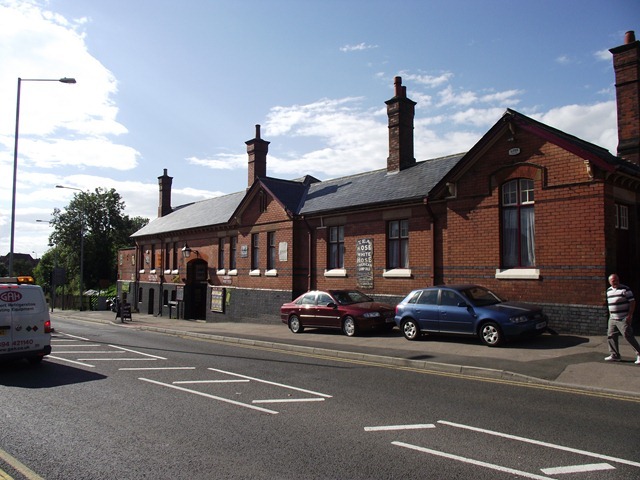 They already operate passenger carrying Steam Days and have ambitious plans to extend the track into Higham Ferrers and establish a small station halt at Higham which will allow passengers to enjoy the centre of Higham. I almost forgot to mention that the society has its own bar in the station which won CAMRA’s National Club of the Year 2010 award. 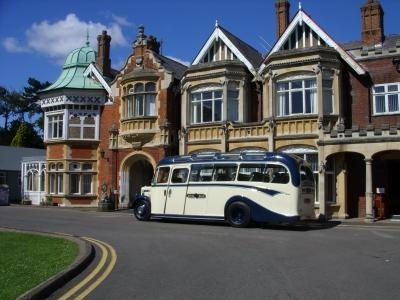 There was a 1965 Northampton Corporation Daimler double-decker bus waiting outside to take us down to the park so we could visit Rushden Hall and the town museum as part of the town’s Heritage Weekend. 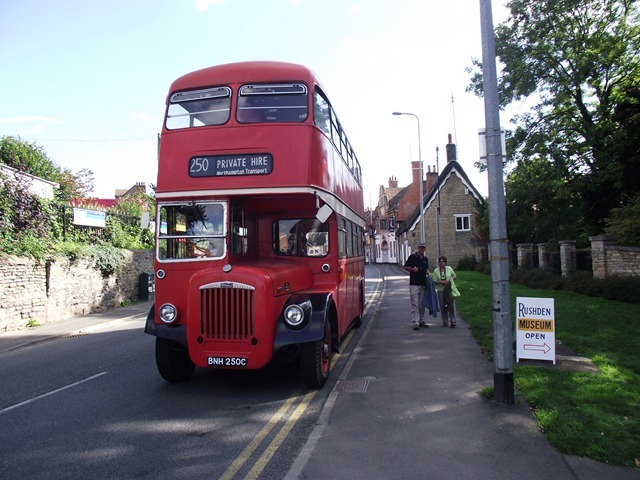 Having been a boy of 15 in 1965 travelling to school daily by bus I found this Northampton bus surprisingly dated for its day (some might say traditional) with its basic utilitarian half-cab and open rear platform. Future events include a Jazz and Steam weekend next weekend and a LMS Branch Line at War weekend in October. Just to show that we didn’t laze about all morning we visited Rushden & Diamonds stadium for a car boot sale & bagged a few bargains including a digital set top box for my sis and a set of Toshiba speakers for the boat. Apologies for the brief intermission since our arrival back at Heyford, we have been busy having visitors, and doing various jobs! We had arranged for our grandson, Morley, to stay with us for a few days and made the trip back to Dursley to pick him up, it seemed so fast driving a car again after eight weeks of boating! We went shopping with him to Attwoolls, a local camping store, and purchased a ‘self inflating’ mattress and pillow which he made himself comfortable on in the back cabin, next to my workbench! We do have a guest bed in the saloon but this would have meant us going to bed at the same time as our seven year old visitor. 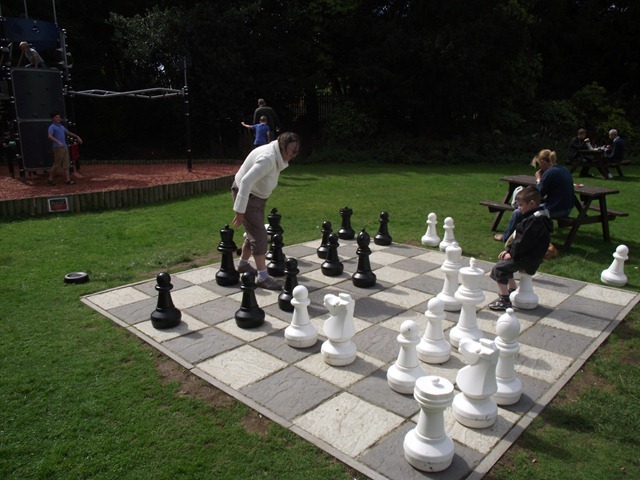 We had a couple of outings with him, first to Bletchley Park (Home of the WWII codebreakers) and beat Grandma at outdoor chess! We also went to Oxford Natural History Museum where he was fascinated by the dinosaur skeletons and the shrunken heads in the adjoining Pitt Rivers Museum, whilst grandpa enjoyed the architecture with its pillars of different stone from all around the UK and the delicate iron tracery of the roof trusses. 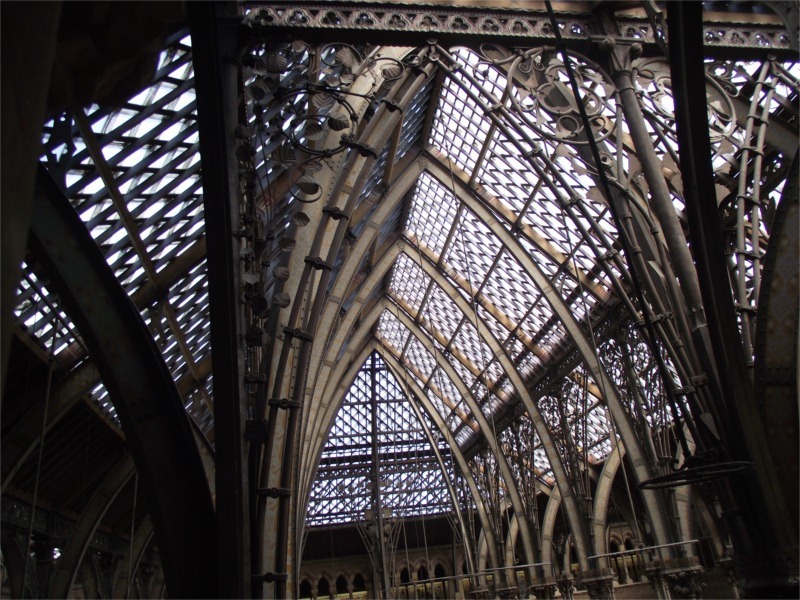 The building itself is one of the finest examples of the Victorian Gothic style of architecture, exhibiting a wealth of naturalist carving; the huge glass roof over the central museum court is supported by cast iron shafts, decorated with wrought iron spandrels. We had to return to Dursley for a meeting at the bank so synchronised this with Morley’s return home. He was very good and endured the meeting at the bank with us in a room with the sun streaming in and broken down air-conditioning! We also took the opportunity to catch up with our friends Myra & Mike for a cup of tea and later Paul & Allison over a meal at the Buthay at Wickwar. Over the next couple of days I did a some jobs on John’s Acorn No 5 fitting a new shower pump and thermostat to the central heating circulation pump as it was running non-stop, a bit annoying as it is sited under the bed! 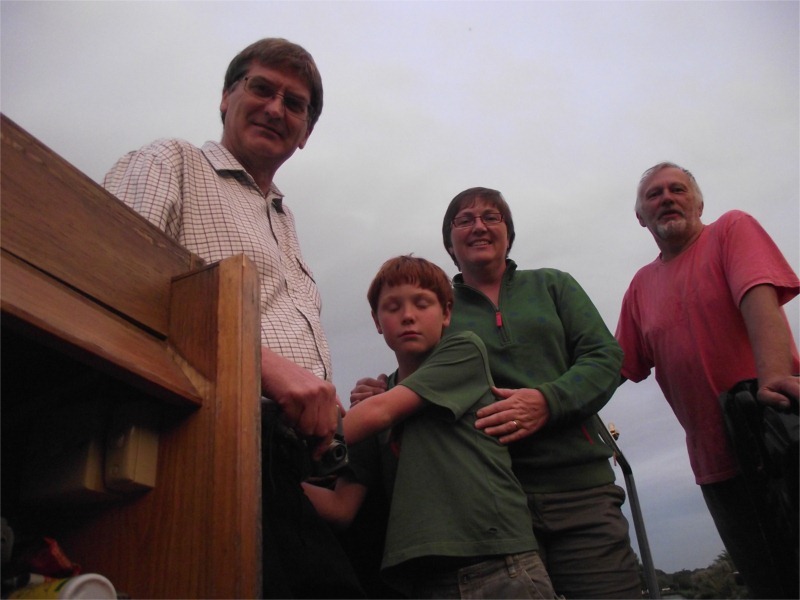 More visitors arrived on Saturday with Joy’s niece, Chris her husband Peter and their son Thomas. We took them for a little cruise down to Kirtlington Quarry and back for a picnic. They all enjoyed the trip, Thomas helped work the locks, explored the quarry, survived falling down some steps and picked enough blackberries to make two apple & blackberry crumbles. Sunday morning dawned early courtesy of a text from Bones who then joined us for breakfast and we spent an enjoyable time catching up with each other’s news before we went off to church. Wrens-Nest has to go into dry-dock for blacking at Tooley’s so the plan was to take her up to Banbury on Tuesday, the forecast wasn’t good however so we set off Monday instead and spent the night just past Twyford Wharf and carried on to Banbury Tuesday morning, winded at Grimsbury Wharf and managed to find a space at Castle Quays where we stayed until delivering our boat to Tooley’s on Thursday morning. We are now temporarily homeless until it’s finished 😦 but don’t worry my big sister, Janet, has taken us in and we are staying with her & Jim for a few days.